I need to shift gears for a few weeks. I’m heading back to China next month for a work trip. I’ll be hosted by my friend and colleague who will host me at her agency in Beijing. After that we’ll head to Shanghai and Xi’an. Her parents lived here for a year a few years ago and I spent a lot of time with them. Her mother is an elementary school teacher and her father a literature professor. This is the first time I’ll visit them and we are all very excited. One of the things I’ve been thinking about is whether I’ll be able to blog while I’m there. It looks like WordPress.com was blocked there but isn’t now, so likely I’ll be able to continue. I have some creative ideas for sharing my reading during my trip, so I’m particularly glad to hear this. 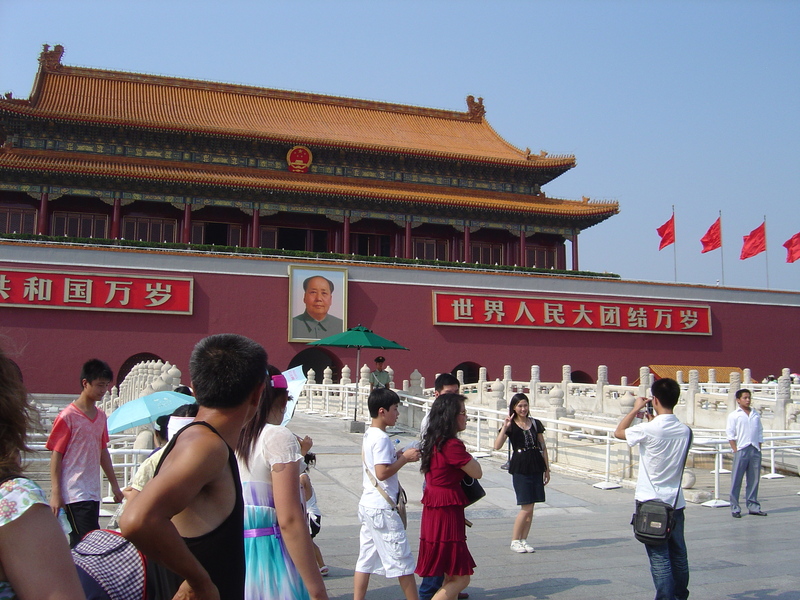 I was in China two summers ago, but only Beijing, although I certainly saw a lot of Beijing. This was a work-related trip, but the conference I was at also set up a lot of sightseeing trips, which was great. And Yanjie’s colleagues were also lovely hosts, helping me to see some additional sights. 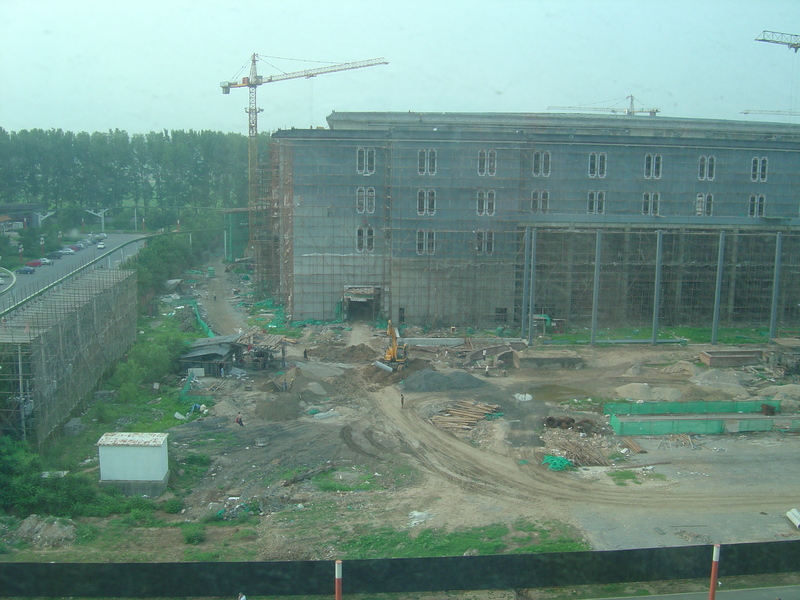 Our hotel (I was there with a work colleague) was part of a huge hotel/spa complex on the Northeastern edge of Beijing. We were out in the country. Across the street was a large river and a village where the 1000s of workers at the hotel complex lived. My US colleague is a birder and we walked along the river and saw a lot of raptors and herons that were new to us. I loved the fact that we could hike across the highway and go for miles along the river. 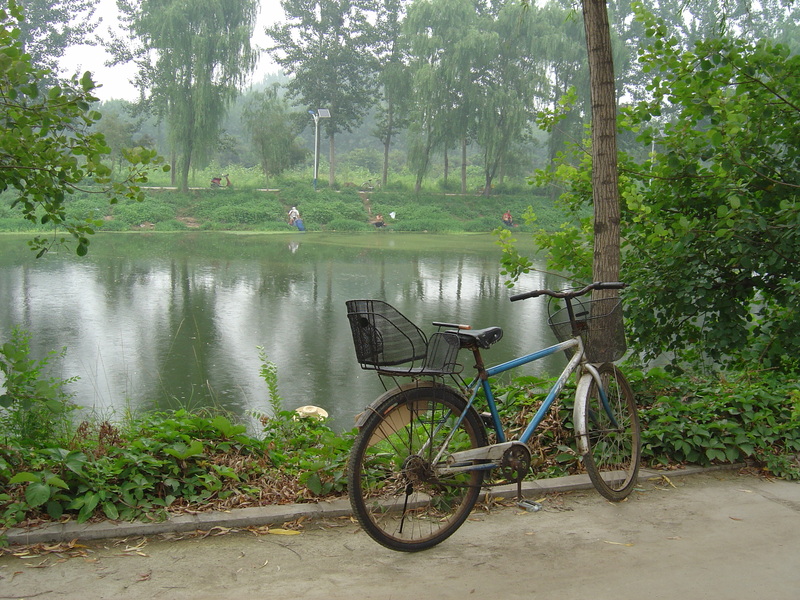 It was also wonderful that I encountered villagers walking and biking and fishing over there. I only knew (know) a few words of Chinese and we all enjoyed speaking in our limited way. Our hotel complex, the Jiuhua Resort, was surreal. It is a famous retreat for wealthy and powerful Beijingers who go there for conferences, hot springs, and plastic surgery (yes!). There are so many massive, nearly empty hotel buildings there. 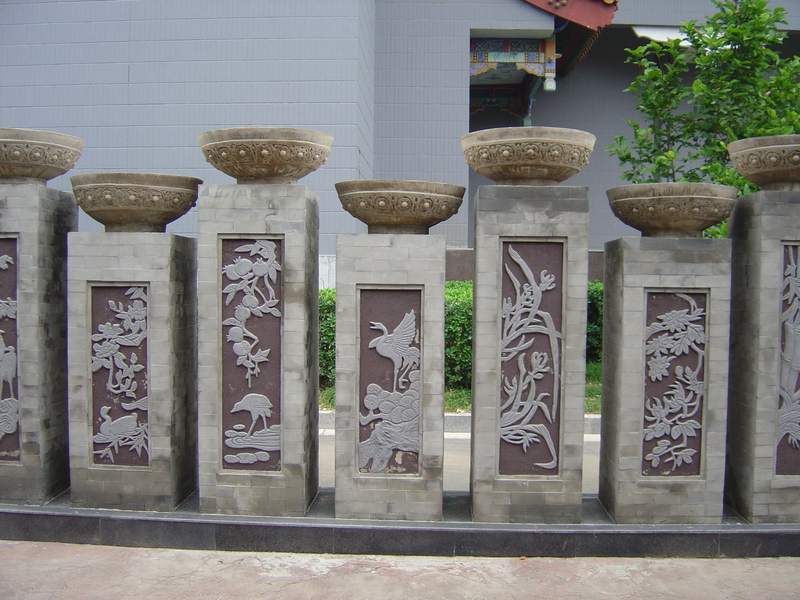 And beautiful touches, like these sculptures. But Beijing is nothing if not a study in contrasts – so you had this very posh resort and then at its heart they were building another quarter mile long hotel building (I believe this was the largest building I’ve ever seen). Although it was surrounded by a high, black fence, I could see into the complex from my hotel room. And see the workers, some of whom lived on site. You can just make out one of their shacks in front of the corner of the building, by the crane. The workers started at 6 am and ended at 9 pm. There were apparently no sanitation facilities on site as I could watch them eliminating outside their shack. The classic 21st century Beijing photo is skyscraper construction on an unprecedented scale in the background and, in the foreground, something from the 19th Century, like a worker’s hovel or rickshaw. This is a very accurate depiction of the strange mix that is Beijing. Hospitality is very important in China and I was not allowed to pay for anything, including mementos to take home. So, this brings me to books. 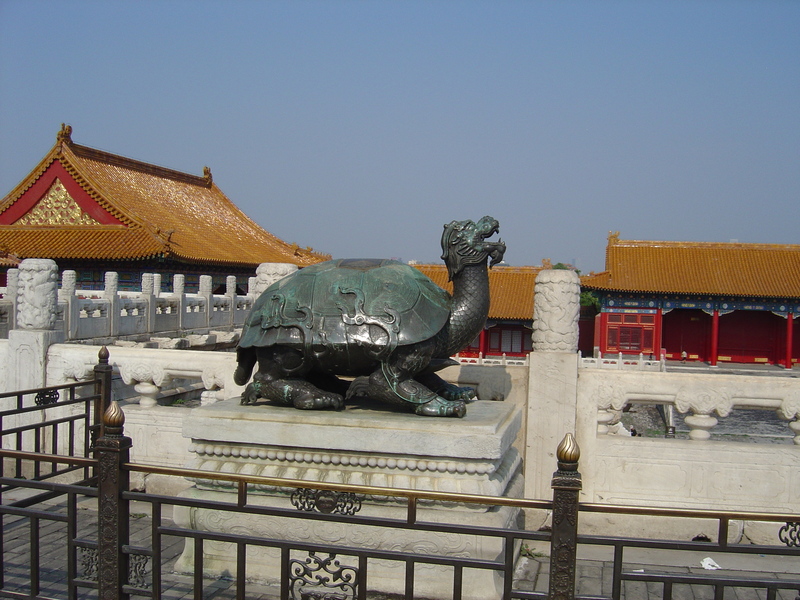 I’ve been a “China watcher” since I was a teenager and my first major in college was Asian studies. I read and studied a great deal about China and studied Chinese (and Japanese) although I didn’t get too far and don’t remember much. Nonetheless, since the mid-1970’s I’ve been interested in the country, but this was my first visit. 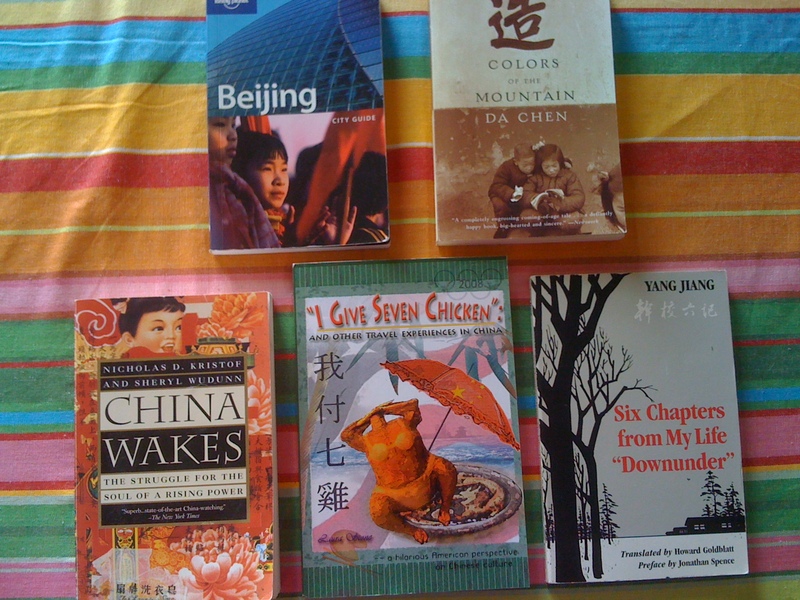 In preparation for my visit and since then, I’ve stocked up on China-related books (and Chinese language apps for my iphone which are teaching me Chinese through wireless proximity to my brain, it is very advanced!). This is my China library. The first pile is what I own in hard copy and have read (I have a few kindle books on China) and the next two piles are what I own, but have not read. 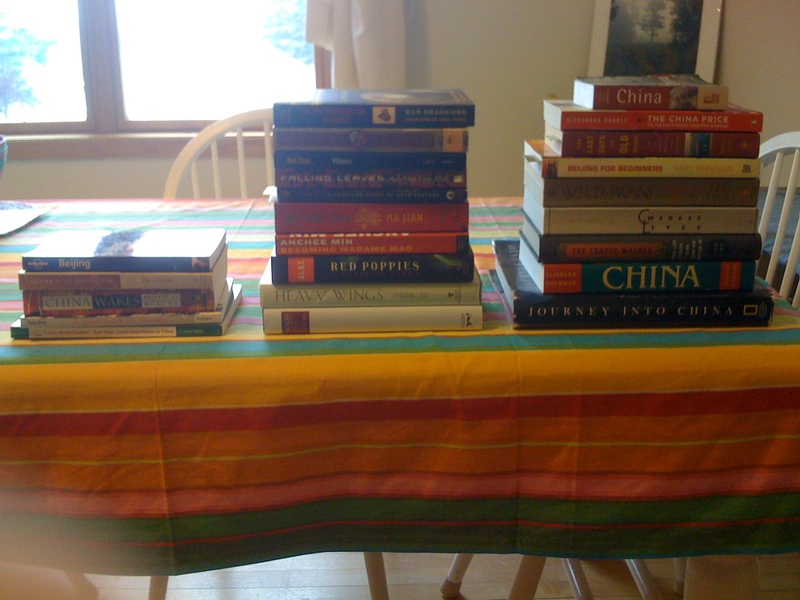 As I completed some of the basic prep for my trip this week, I realized that I only have a few weeks left and should focus my reading on China. So I am. 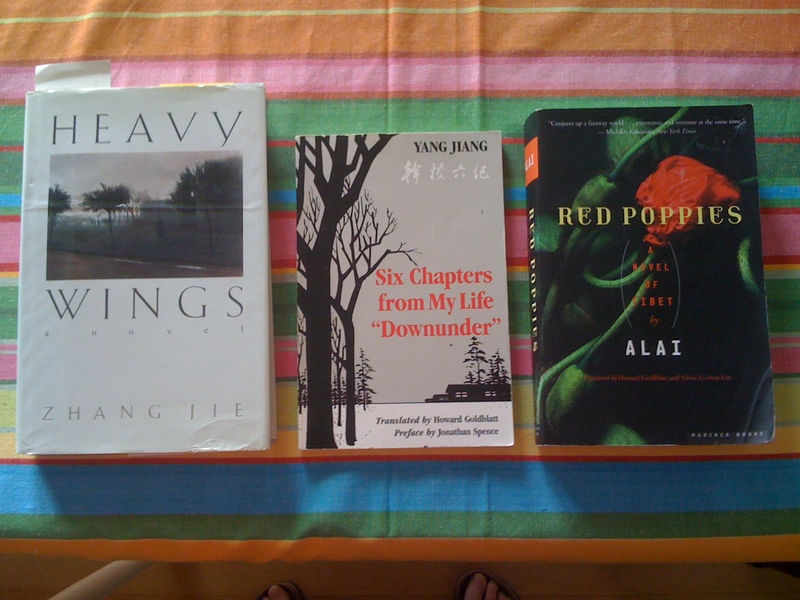 While my student’s parents were here, I asked her father to recommend some translated Chinese novels. These are three books he recommended. We took pictures of the books for his friends as they hadn’t seen their books in English. It moved him deeply that I bought these books. I read one (Six Chapters) while he was here and we had a wonderful discussion about it. It is the story of an intellectual sent away to a farm camp during the Cultural Revolution. This is a common, but important, story for Chinese intellectuals of a certain age. I had not gotten to the other two, but obviously at this point, it is very important that I do so quickly. 67) A Dictionary of Maqiao by Han Shaogong (HC, 1996) Joy tells me that this is an experimental novel in very widely respected style – it sounds like modernist stream of consciousness writing, dunno if I can make my way through that. 69) Waves by Bei Dao (HC, 1985) Another Cultural Revolution tale. 74) Journey into China by the National Geographic Society (1982, HC) This massive coffee table book was a gift from a Chinese friend before my first trip to China. 75) Wild Swans: Three Daughters of China by Jung Chang (1991, HC) Jung Chang immigrated to England. This is the story of women in her family during the 20th Century in China. 77) Beijing for Beginners: An Irishman in the People’s Republic by Gary Finnegan (2008, HC) Another one I enjoyed and thought I’d finished – again, the bookmark partway through says no. 78) The Corpse Walker: Real-life Stories, China from the Bottom Up by Liao Yiwu (2008, HC) He was imprisoned for four years for writing an epic poem about the Tiananmen massacre. But he still lives and writes in China. 79) The China Price: The True Cost of Chinese Competitive Advantage by Alexandra Harney (2009, HC) While those of us in the U.S. enjoy the low cost of Chinese goods at the expense of U.S. factory workers, China enjoys an economic boom and lifting of poverty at a rate unprecedented in human history. However, the cost is enormous. China’s pollution problems and associated human and environmental impacts are also unprecedented and horrific. And the lack of factory safety, low wages, child labor, long hours, etc. etc. are also taking an enormous toll. This is a book about those costs. I also have some China-related books on my kindle, but I’m out of steam and will probably read some of these while I am in China. So, there you have it! I know I probably can’t finish all these books before I go, but I can work my way through a lot. What I learn will enable me to discuss the novels Joy’s father recommended with him when I see him. They will also enrich my trip greatly. I’ve found that my Chinese colleagues, who are generally all PhDs, very much appreciate talking with an American who knows a bit about China and is eager to learn more. My sense of China these days is that it is still authoritarian, although there are tens of thousands of protests about various issues every year and, increasingly, democracy in some spheres, such as the elections of local officials. Corruption is a huge problem. There’s a lot more freedom to speak frankly and criticize, except when there isn’t – government crackdowns on activists and journalists continue. Lots of internet sites are blocked in China. On the other hand, my Chinese professor friends had bought their first apartment (at about 40 years old) and car within the past few years. This is the kind of thing that Americans take for granted, especially for professionals, yet it is a completely new thing in China. This has occurred because of the economic boom occurred and growing middle class. I, and many others, believe that the 21st Century is China’s (and India’s) century, but when you talk to educated Chinese, they still see the rampant poverty, lack of democracy, and enormous environment problems. 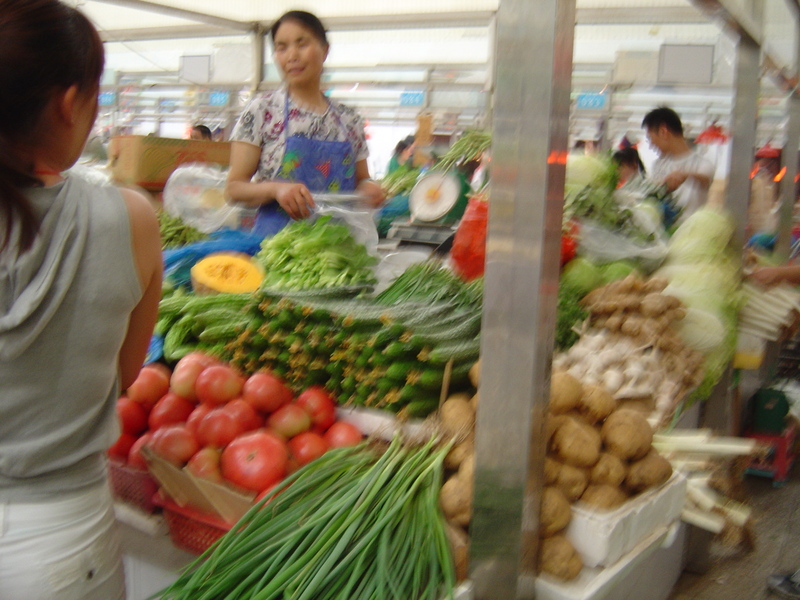 The Chinese goods that are sold to Chinese are frequently of very poor quality and, sometimes, can be deadly. As a current example that I’m sure is very painful for the Chinese, the high speed train system that experienced the late July crash, has been found to have design flaws (associated with corruption) and many trains have been recalled. 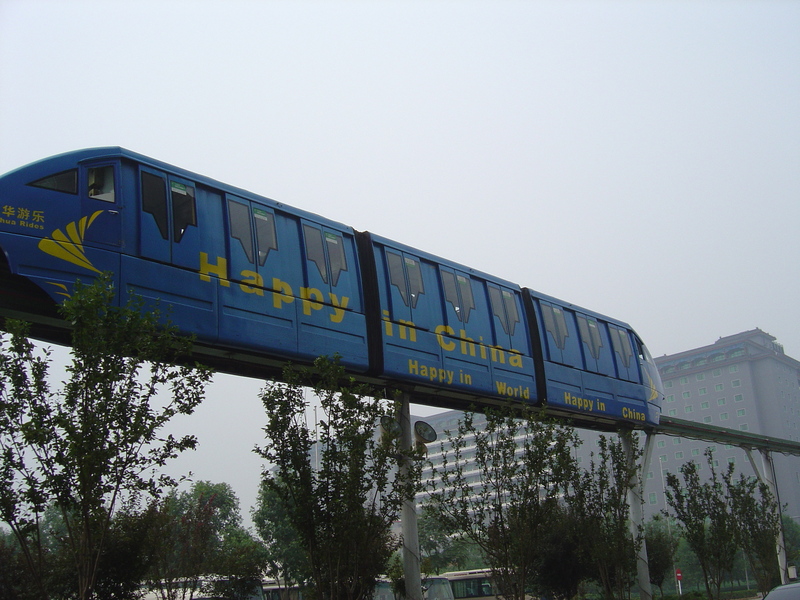 The Beijing to Shanghai line we are supposed to take has had many problems. These are the kinds of things the Chinese point to to say that they have an awfully long way to go. I number books I will read this year by the order in which they are mentioned in my blog. HC refers to hard copy. You might enjoy Peter Hessler’s River Town. Other books of his are Oracle Bones and Country Driving. I’ve also had recommended to me a book by his wife, Leslie Chang, Factory Girls: from Village to City in a Changing China.